Ranking higher in search engines is every blogger’s wish. To rank better, we need to have good content and SEO. As Blogging is now a competition between millions of blogs, it is not easy to rank higher. Every blogger is trying to get their content to reach on the first page of search results. And only the best one’s rank. Have you noticed some blogs which don’t have any content rank higher? These type of pages which ranks are using Black Hat SEO Techniques and that doesn’t remain there forever. Using some techniques to convince search engine bots that a page has sufficient content. If you are not able to understand what I meant, we can take a look at some examples. 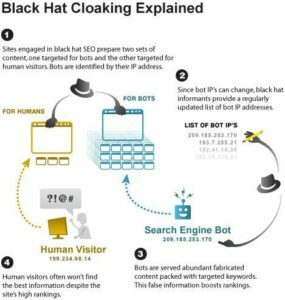 There are many Black Hat SEO Techniques. In this post, I am going to cover some of the major techniques. These techniques have many bad effects and I suggest you not to use these. Adding irrelevant keywords to a post or a page to rank higher. This is to convince search engines that a post has sufficient content. Copying a content from other blogs or websites and publishing it on your blog. This is Duplicate Content or Copied Content. Commenting on other blogs and websites with adding links or details of your blog. This is to get irrelevant visitors and engagements to your blog. Commenting on your blog with other names yourself. You may be thinking, how search engines could understand these? All the comments published are using different IP Address. If the comments are in different names and same IP Address. It will be easy for search engines to catch it. Adding keywords to a post with the same color of the background is called Invisible Text. This cannot be visible to the visitors or readers. But it is detected and indexed by search engines. Making a separate page for a certain search term with a lot of keywords in it is called Doorway Pages. Visitors to these pages are redirected to the original post the website owner wants them to see. Paying some money to other website owners to increase backlinks and visitors in an irrelevant manner. Listen to what Matt Cutts, the head of webspam team at Google has to say about Paid Links. Cloaking is a method of showing a different type of results to the visitors and search engine bots. It is harder for search engines to find what really a web page is all about. Search Engines like Google are becoming smarter now to find web pages using Cloaking method. Thus this problem is eventually decreasing. Let’s hear about what Matt Cutts has to say about Cloaking. Now I hope you understood what are the different techniques of Black Hat SEO. Let’s look at the effects of using these kinds of techniques. 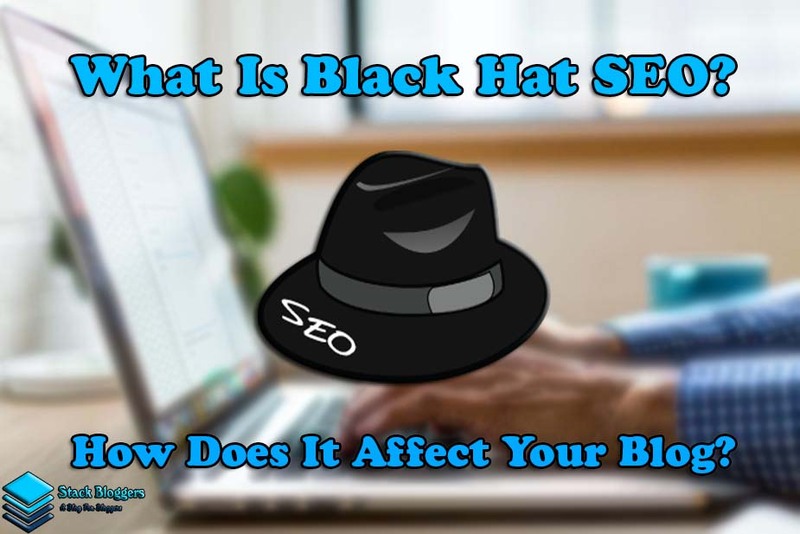 How Does Black Hat SEO Affect A Blog? As we know Google and different kinds of search engines are very smart. When we use a Black Hat SEO Technique, search engines can index that web page and penalize it. A page that used Black Hat SEO technique can rank in search results and will not remain there forever. Google can understand what the page is all about and it is programmed to understand if it has relevant content. Search Engines are picking the best pages in millions to show users the perfect results they want. If it shows any irrelevant content, the problem goes to search engines and not to those fraud web pages. What Will Happen If Google Penalize Your Blog? Add your blog or website. Leave the text box empty and click on Fetch and Render. By following these steps, you can get back your site. Make sure that you didn’t use any kinds of Black Hat SEO Technique on any page. Avoid using any kinds of these techniques. Yes, there are many blogs making money by doing these methods. Actually, these are useless and earning money must be in a relevant and legal way. Work hard and be consistent, you can make your blog successful. Follow these 15 Top & Best SEO Techniques to rank higher. We will cover an article about earning money in the upcoming posts, so Stay Tuned! If you liked this article, share this and Follow Us on Facebook, Instagram, Twitter, and Google+. See ya in our next post. Howdy cool site! Gentleman alt tags SEO. Excellent. Superb. I’ll bookmark your blog and make RSS feeds in addition? I’m pleased to search for plenty of practical info here within the create, we require workout additional techniques normally indicate, thanks for discussing. Happy to hear that you like our post.